As a large, complex, multinational company, it isn’t all that obvious which decisions are made at which Novartis sites around the world. This article aims to provide a better understanding of the kinds of business decisions that Novartis makes, and the corresponding sites where those decisions are made. We’ve classified the major outsourcing decisions into four categories to you give you a jumping off point when considering where to focus your sales outreach to Novartis: Contract Manufacturing Decision Making, Logistics Decision Making, Drug Discovery Decision Making, and Clinical Trial Decision Making. Novartis invested roughly $9B USD in R&D in the last year (comparable to their R&D expenditures in recent years). Couple that with the 175 projects currently in development, and you’ve got a goldmine of outsourcing opportunities. 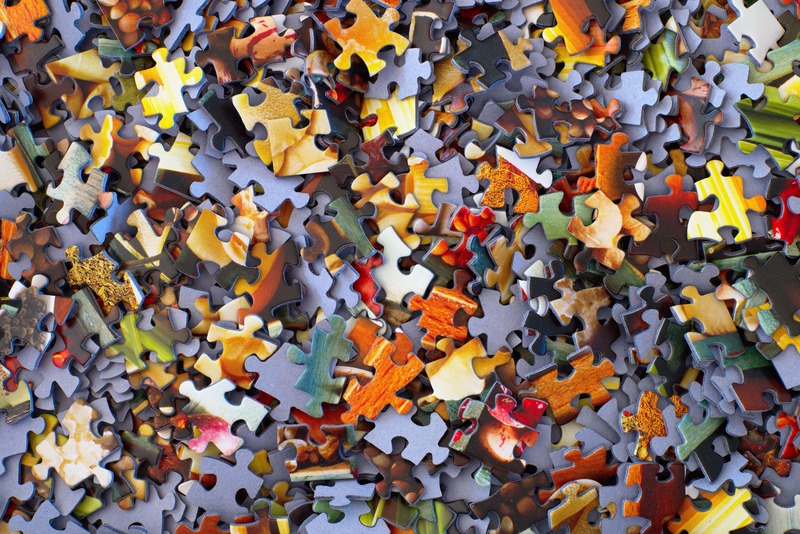 Although there is potential for many different types of service providers to capitalize on Novartis’ operations, different providers require access to different teams within the company. Contract manufacturing organizations, for example, will be interested to learn where manufacturing decisions are being made, while a clinical site would naturally be more concerned about where clinical trial decisions occur. The following will provide insight into the four major decision making categories and help to give you an overview of Novartis on the global canvas. Check out the map at the bottom of the article to see all the major locations where Novartis decisions are made around the world. The External Supply Operations (ESO) team oversees CMO activities at Novartis. The European ESO team’s decision makers operate out of Basel, Switzerland. The APAC and MEA ESO decision makers are based in Shanghai, China. The decision makers for the Americas ESO team are located in East Hanover, New Jersey and Princeton, New Jersey. It is important to note that while Novartis currently employs CMOs across its biologics network, they are planning a shift towards greater self-sufficiency that will minimize their need for CMOs. Logistical decision making is of foremost importance to service providers looking to capture business from Novartis’ outsourced manufacturing and supply. Since Novartis is such a large company, they have a plethora of drug products as well as manufacturing sites which can make it difficult to know where to best target any outreach efforts. A trend we observed is that Novartis tends to classify production sites according to their three main brands: Novartis pharmaceuticals, Alcon eye care products, and Sandoz generics and biosimilars. This results in certain regions, such as Pennsylvania, having a pronounced ophthalmology presence due to Alcon’s production site in Sinking Spring. The majority of logistics and operations for the US are spearheaded out of East Hanover, NJ while Basel, Switzerland serves as the European counterpart. This includes logistics for Novartis, Alcon, and Sandoz products. The head global program managers are the decision makers for both regions and they manage the global program team directors as well as the global project managers. The head of clinical enterprise logistics is also based out of East Hanover. Morris Plains, NJ is one of the main manufacturing sites in the US where supply chain decisions are made. The regional head of commercial supply chain is based this location. Fort Worth, TX executes packaging, supply chain, and sales & operation decisions with a focus on Alcon products. A notable decision maker based out of Fort Worth is the business process expert for logistics. 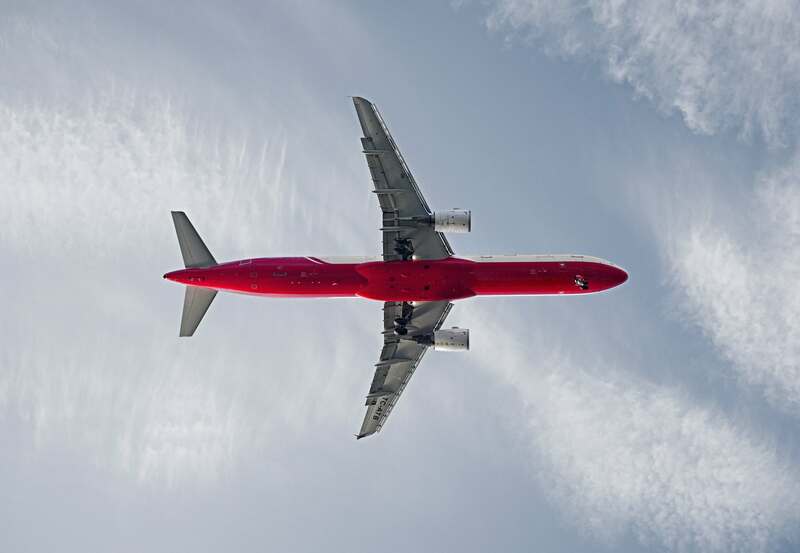 Shifting to Europe, Stein, Switzerland is where logistic decision making occurs as it is closely related to corporate strategy which takes place in Stein and in Basel. Logistic decisions in India are based out of Hyderabad. Job titles relevant to these decisions include program manager and project manager. The North American supply-chain director for Sandoz is based out of Mechanicsburg, PA. Also look to Melville, NY for a supply-chain director. While Eastern Europe does not appear to be involved in many managerial decisions surrounding outsourcing, there is a European clinical contracting manager in Prague, CZ. Puurs, Belgium and Kundl, Austria are also involved in European supply chain operations. The the global logistics head is located in Brussels, Belgium. 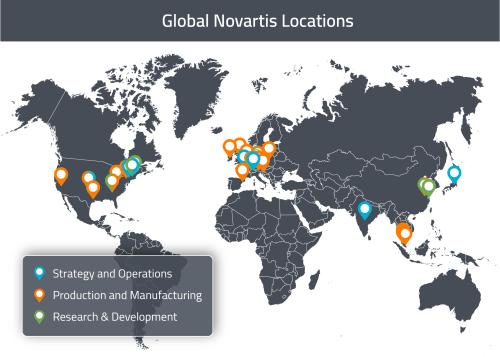 Novartis’ major production sites are in the following cities: Barbera – Spain, Barleben – Germany, Basel – Switzerland, Fort Worth - Texas, Grimsby – UK, Grosswallstadt – Germany, Holzkirchen – Germany, Houston - Texas, Johns Creek - Georgia, Kundl and Schaftenau – Austria, Ljubljana – Slovenia, Puurs – Belgium, Ringaskiddy – Ireland, Rudolstadt – Germany, Stein – Switzerland, Strykow – Poland, and Wehr – Germany. Novartis’ discovery and R&D is dispersed among multiple global sites which tend to specialize in certain research areas. The location of your decision makers is going to vary depending upon the point in the discovery cycle your sales efforts are targeting, as well as the particular therapeutic area you specialize in. The company’s global research operations, called “Novartis Institutes for BioMedical Research” (NIBR) has its global headquarters in Cambridge, MA. Two research institutes reside within NIBR that focus on diseases in the developing world: Novartis Institute for Tropical Diseases, which works on tuberculosis, dengue, and malaria; and the Novartis Vaccines Institute for Global Health, which works on salmonella typhi (typhoid fever) and shigella. The headquarters is home to research in the areas of oncology, ophthalmology, and cardiovascular and metabolic-related diseases. Co-located with Novartis’ corporate world headquarters, the research facility in Basel centers their drug discovery on autoimmunity, transplantation, and inflammation, as well as musculoskeletal diseases, neuroscience and oncology. Operating on the same campus as the US Pharmaceuticals Division headquarters, the East Hanover site is devoted to research in cardiovascular and metabolic diseases. It is also home to information analysis, preclinical safety, and metabolism and pharmacokinetics groups. The Emeryville campus, in the San Francisco Bay area, concentrates on early discovery and research activities as a hub for infectious disease research, with additional expertise in structural and biophysical chemistry, computer-aided drug design and protein engineering across disease areas. Novartis also has an integrated biomedical Research & Development center in Shanghai, China. Research here focuses on infectious causes of cancer primarily found in Asia and includes efforts in discovery chemistry and biomarker research. The Friedrich Miescher Institute, located in Basel, is devoted to fundamental biomedical research and focuses on epigenetics, growth control and neurobiology. Located in San Diego, the Genomic Institute of the Novartis Research Foundation (GNF) develops novel technology to drive cutting-edge drug discovery research, identify new biological pathways and discover mechanisms underlying human disease. Service providers looking to reach out to Novartis when clinical trials have been announced or are about to commence can focus their efforts on the divisions listed in the following paragraphs. Novartis oversees progression of their clinical trials through their global data centers and division headquarters. Many clinical decision makers and operations personnel are based out of these locations and they share fairly similar keywords in their job titles such as trial manager or clinical management. The Fort Worth, TX data center is the headquarters for Alcon, Novartis’ eye care division. Someone on the clinical management team would make for a good contact to reach out to if you are looking to cover ophthalmology products in trials. However, clinical trial oversight and management is based mainly out of East Hanover, NJ and a good point of contact would be someone with the job title of global trial manager. Service providers looking to cover commercial operations for Novartis’ biosimilars division, Sandoz, should look at covering Holzkirchen, Germany for Europe and Princeton, NJ for the US. Key individuals based out of Germany include the global product manager who contributes to clinical trial strategy and execution, the global head of clinical operations, global brand manager of oncology and global OTC life-cycle manager. Much like Alcon, Sandoz’s US headquarters does not house any individuals who would be responsible for clinical trial management. For trial management, look to East Hanover, NJ for someone with trial manager or program manager in their job title. The Basel and Stein data centers in Switzerland are the European equivalents of the East Hanover facility, as they comprise the hub of all pharmaceutical trial coordination. The key titles to look out for here are global trial manager and clinical manager. A noteworthy position is that of the therapeutic area head for early products who is based out of the Rotkreuz site in Switzerland and is responsible for the progression of products in the early stage. In India, clinical trial oversight and management takes place in Hyderabad. Related job titles include clinical distribution and clinical management. 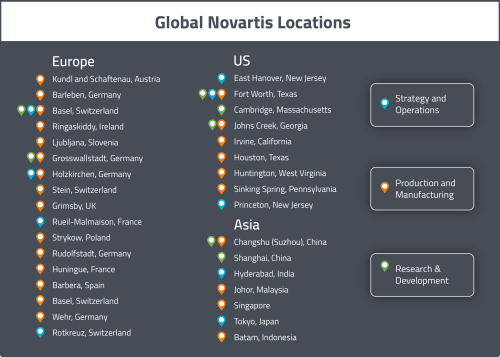 This global map and accompanying list of locations displays the major Novartis sites and designates their area of focus. 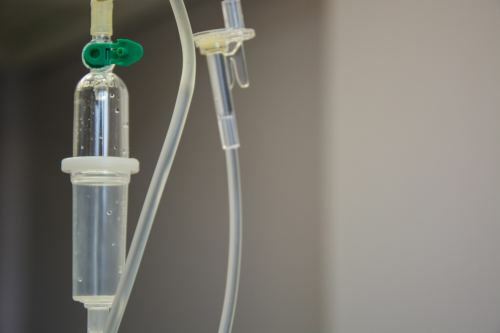 Blue sites fall under the “strategy and operations” umbrella, which covers clinical trial management as well as outsourced, contract manufacturing decisions. Green sites focus on drug discovery and R&D. Orange sites are responsible for Novartis production and manufacturing as well as some supply chain decisions. 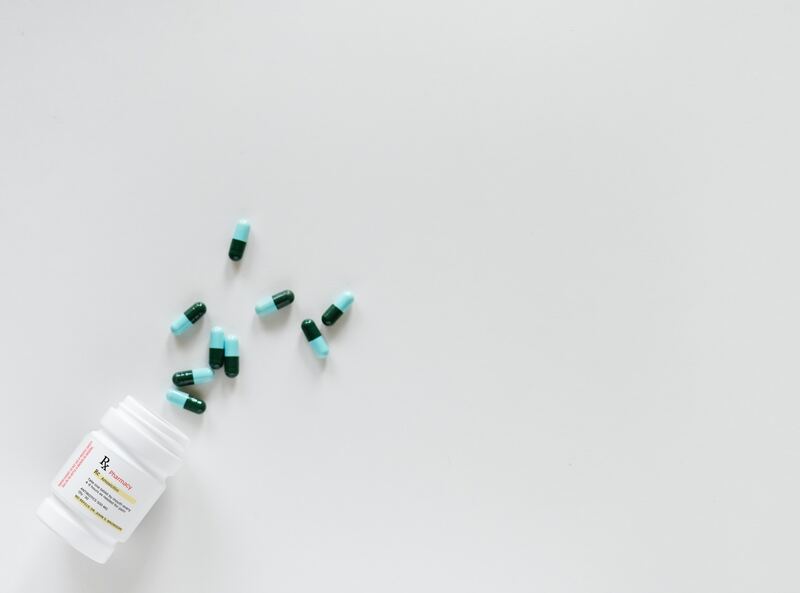 While this article cannot claim comprehensive coverage of Novartis’ operations due to the ubiquitous nature of the company, we hope that it has provided you with insight to help you increase your sales. Reference it anytime to ensure that your outreach is targeted appropriately within Novartis. Where can I find more information about sponsor companies? If you would like a simple solution for keeping an eye on drug sponsor companies, like Novartis, without relying on a database and generic lists of leads each week, we at Zymewire are here to help. Reach out today, and check out the next instalment of Sponsor Atlas: Selling to the Pharma Giants for a map to sell to Bayer! If you enjoy these articles, please feel free to spread the word and share them through the links below!